The first visit of a new Loire class French navy tug is marked today with the arrival of Rhône, second in the series after the class named vessel, Loire A602. 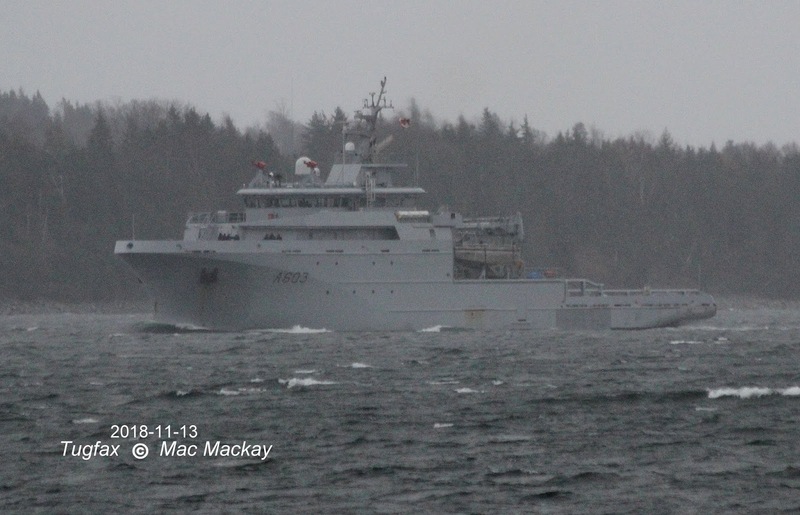 Weather turned blustery later this afternoon and rain filtered the view of the ship as it arrived. The French Defence Procurement Agency will take delivery of two more of the class in 2019, namely Seine A604 and Garonne A605. 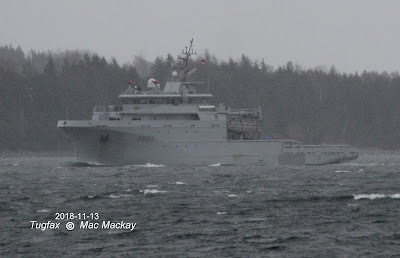 Rhône is designated A603, and classed in French terminology as BSAH, "batiment de soutien et d'assistance hauturier" [meaning offshore support and assistance] indicating its multi-functional role as a deep sea towing and rescue tug. It is also equipped to deal with port work, carrying a 300m pollution barrier, supporting twelve divers and transporting weapons and ammunition. It will of course also conduct sovereignty patrols and courtesy visits as did its predecessors, and carry disaster relief aid when needed. By the time Rhône got up into clearer conditions the tug At;antic Willow was coming alongside to assist it into its berth at HMC Dockyard. This not the first Canadian port for the ship. It visited Esquimalt in Victoria, BC in late September. 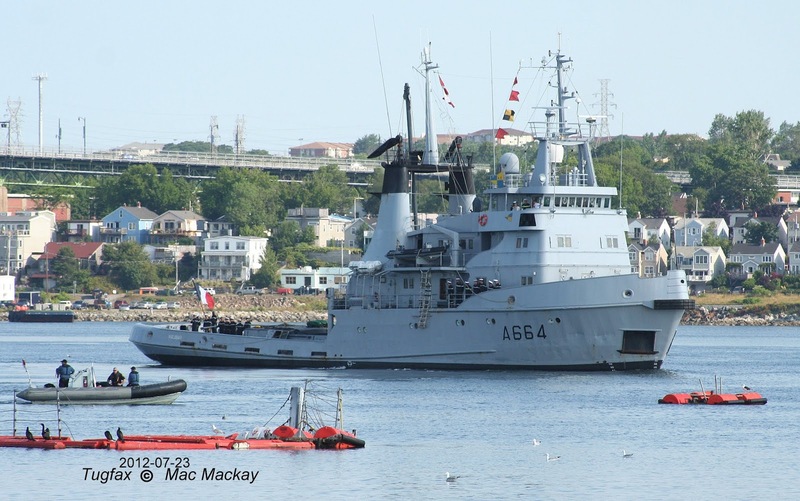 Procurement for the French navy has taken an interesting path with the naval design office working closely with private industry to apply commercial vessel design to semi-military functions such as coast guard, police and customs. 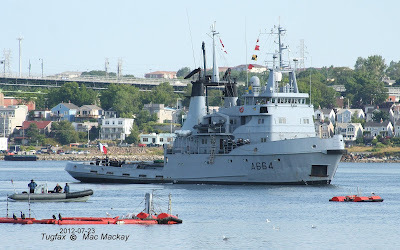 In June Rhone replaced Tenace A669 aged 40, then the oldest ship in the French Navy and one of class of three tugs in the French navy. The last of those predecessors to call in Halifax was Malabar A664. A third tug, Centaure A674 was sold to the Turkish navy, but damaged beyond repair in a drydock accident in 2013. 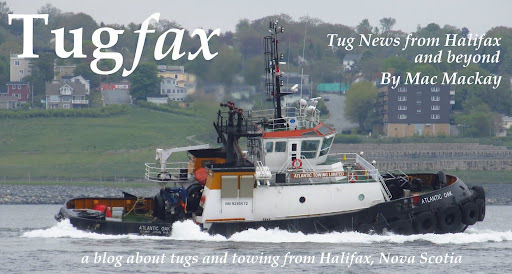 They were built to the same design as the German civilian tug Hamburg which was broken up in 1986 with irreparably damaged engine and gear box.